Sri Lanka will settle for nothing less than a 2-0 series whitewash in the second and final Test against England in Colombo from Tuesday, as the buoyant hosts celebrate 30 years of Test cricket. Sri Lanka won the first Test in Galle by 75 runs, meaning a draw would be enough at the P. Sara Oval in the Sri Lankan capital for a first series Test victory since 2009, when they beat New Zealand 2-0 at home. “We will go for 2-0 because we play our best cricket when we are positive,” skipper Mahela Jayawardene said on Monday. Andrew Strauss’s spin-wary England will slip to number two in the world rankings behind South Africa if they lose or draw the second Test, but Jayawardene said his team was not going to show the tourists any mercy. “When you play a team like England, you have to be aggressive and look to get in front of them from the first ball. They are a strong side and will come hard at us,” he said. “But we are prepared for that and ready to play good cricket. We played well in Galle and must now look to improve on that.” It was at the same venue that Sri Lanka played their inaugural Test in February 1982 against an England side led by Keith Fletcher, which won by seven wickets inside four days. The Galle win was only Sri Lanka’s second, and the first at home, in 18 Tests since world bowling record holder Muttiah Muralitharan retired in 2010 with a record 800 Test and 534 one-day wickets. The other win came in December, when they thumped South Africa by 208 runs in Durban, but went on to lose the series 2-1. Left-arm spinner Rangana Herath, who claimed nine wickets against South Africa, destroyed England in Galle with six wickets in each innings to earn the man of the match award. 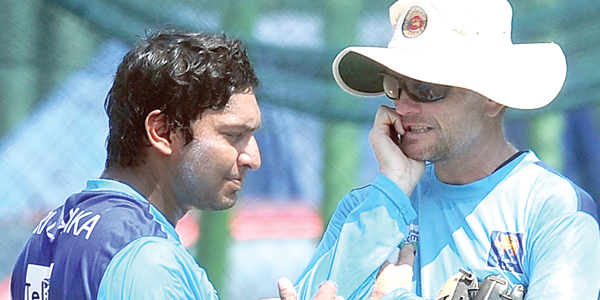 Jayawardene said the P. Sara Oval wicket will provide exciting cricket over the next five days. “It is usually a very good Test-match wicket,” he said. “There will be something in it for the quicks. The spinners will also come into play, batsmen will get value for their shots and the outfield is quick. “We like playing at venues like this which favour us. That’s what home advantage is.” The success of sixth-ranked Sri Lanka over the world’s number one team in Galle did not surprise Jayawardene, who hit a match-winning 180 in the game. “There are five to six teams in world cricket who can beat each other, given the conditions,” he said. “That is a good balance to have.” Sri Lanka make two changes from the side that won in Galle, bringing in fit-again Angelo Mathews and seamer Dhammika Prasad for batsman Dinesh Chandimal and injured paceman Chanaka Welegedara. England (from): Andrew Strauss (capt), Alastair Cook, Jonathan Trott, Ian Bell, Kevin Pietersen, Ravi Bopara, Samit Patel, Matt Prior, James Anderson, Tim Bresnan, Steven Finn, Monty Panesar, Graeme Swann. Sri Lanka: Mahela Jayawardene (capt), Tillakaratne Dilshan, Lahiru Thirimanne, Kumar Sangakkara, Thilan Samaraweera, Angelo Mathews, Prasanna Jayawardene, Suranga Lakmal, Suraj Randiv, Rangana Herath, Dhammika Prasad.